Not a shabby way to start up. I call the founder, founders or founding team of a company “The Abraham.” The Abraham influences all that follows, sets the vision and direction for the company, and the Abraham’s mores, habits, preferences, flaws and prejudices are often built, consciously or unconsciously, into the fabric of the company. This influences the products and services, first and foremost. But the Abraham also influences everything from company HR policies, the kinds of employees that work there, its investors, its customer service and even its logo and office decor. You can often tell what the founder cared about, and didn’t care about. You go to Google and it’s like a playground for adults (curious, smart adults) — massive dinosaur in the courtyard, lego tables, beanbag chairs, primary colors — and then you read interviews with Larry and Sergey where they credit their success to having attended Montessori schools, and you see where it came from. Often the Abraham is CEO, but doesn’t stay CEO. Google’s Abrahams are Larry and Sergey, and they had a strong influence on the company even during the 10 years that Eric Schmidt was CEO. Oracle is very Larry Ellison. Martha Stewart is very Martha Stewart. Zynga is very Mark Pincus. Groupon is very Andrew Mason. And isn’t Apple so very much Steve Jobs, so much so that when he left, and his successors tried to kill the Abraham, the company nearly died? It’s hard to kill the Abraham. Not only that, if you succeed, it may not be possible for the new leader to assume the mantle. Best for the Abraham to stick around, and work closely with the new leaders to make sure the spirit of the company survives. This has been, in my experience and observation, the best method for retaining the magical juju. This is why the role of incoming, non-native CEO at a startup is a notoriously difficult job. They don’t fit in with the company culture. Most of them don’t last a year. Companies without a strong Abraham lose their way. If you can’t identify who is at the helm, it better be a commodity business that anybody can run (Warren Buffett: “Invest in a company any fool can run, since some day a fool will.”) Did Pierre Omidyar leave too early, or cede too much control to be able to set the course for eBay? In the book The Perfect Store the author talked about Meg Whitman asking if Pierre was going to stay, but did he strongly influence its direction? Yahoo wasn’t led for very long — from what I can gather, less than a year? — by David Filo and Jerry Yang, its Abrahams. The Abraham can also lose control when the extent of the empire becomes too great, and the Abraham can no longer see what’s happening in the farflung regions. The farther you get from the people you are making decisions for, the worse those decisions are likely to be. The Abraham is especially powerful in social software, in anything that shows the people, the members, what to do, how to communicate, and how to behave. The founders dictate what the software does, how people use it, what the practices and mores are of the community. This is built into the software, and its assumptions of human behavior. As Larry Lessig noted, The Codes is the Law. In social software how you interact with others is influenced by what values are built into the software. On Facebook we are very much living in Mark Zuckerberg’s vision of society. MySpace was like Chris and Tom, Friendster was like Jonathan Abram, LinkedIn is like Reid Hoffman. Foursquare is very much like Dennis Crowley and Naveen Selvadurai. And dare I say Flickr was like something that would have happened if you put some English majors, a philosopher, some artists and hackers in a blender. There’s a lot of glory in being the Abraham — you’re the father of three religions, after all. People follow your lead. But most founders aren’t thinking about this when they start out, they just like making things, have a vision of something new. In dreams begin responsibilities, as Delmore Schwartz wrote. Abrahams are often called upon to do difficult work, thankless tasks, and sometimes, terrible things, as when god asked Abraham to kill his own firstborn son, Isaac. (Isaac lived to beget Jacob, but Abraham was ready to end it all right there.) Steve Jobs was rightly praised for his ability to “Kill his babies” — that is, disrupt himself. We may be taking the metaphor too far here, but hey. Let’s. That’s the fate of the Abraham. Kill your babies, or be killed by your babies. Beget something great and the begats will follow! Salmon, Booz, Jesse, Ozias, Zorobabel and all the rest. This post first appeared in a slightly different form on Caterina.net. 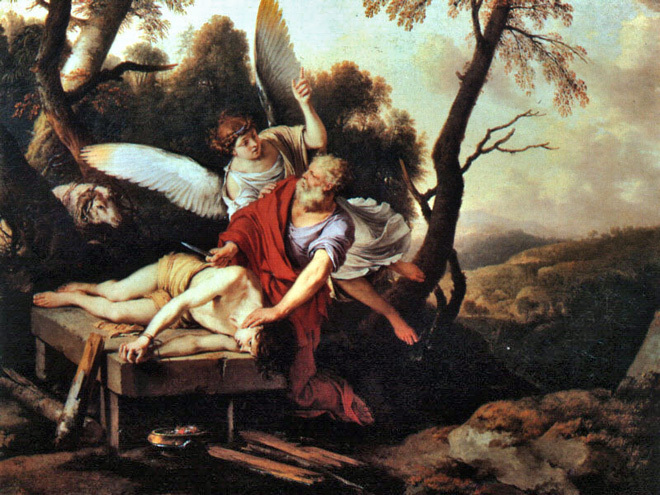 Photo: ‘Abraham Sacrificing Isaac,’ by Laurent de La Hyre; via a Wikimedia Commons.